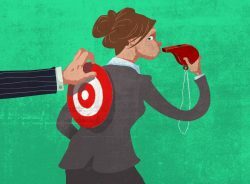 Whistle Blowing – – or Self Entrapment? In today’s society Whistle Blowing is referred to quite often. Mostly it relates to government when an employee notices an act or suspicious occurrence and feels that he should report what was seen. In many states, it is mandatory; you report, anonymously, what you have seen to the appropriate law enforcement agency and they will follow with an investigation, IF it is felt that one is warranted. Failure to do so could result in a charge of “withholding evidence”, usually a misdemeanor, with a heavy fine and up to a 1 year prison sentence. However there could be certain circumstances that could backfire on the “reporter”. For instances, if you were the witness of a child abuse or similar and the abuser knows that you were the only one who had noticed the event or knew the details, you could be set up with a charge that would indicate that YOU were the abuser, especially if the child, under duress, was made to identify you. So, instead of performing your civic duty of reporting, you find that you must defend yourself for the very crime that you are reporting! Is this scenario fair; is there a way out of this? Actually, NO, unless you could establish a foolproof defense usually formulated by a highly paid attorney! So, what does one do, report what he has seen or pay the fine/penalty for not doing so? Whistle Blowing laws were set up to protect the “reporter” from retribution but one must be careful, as the foregoing scenario shows. It could boomerang on you!